We were approached by Land O'Lakes and Purina Mills with a simple, but complex task. How can we speak to backyard, urban chicken farmers in an authentic way, in the spaces they're already communicating? We spent countless hours brainstorming, interviewing chicken farmers, digging through social data and just "crackin' a few eggs" (pun intended) to get at the core of how our desired audience may engage with a bigger brand in the social space. We vetted multiple ideas amongst our local group of chicken owners as well as the broader Purina Poultry Facebook group to get a feel for what resonated the strongest. 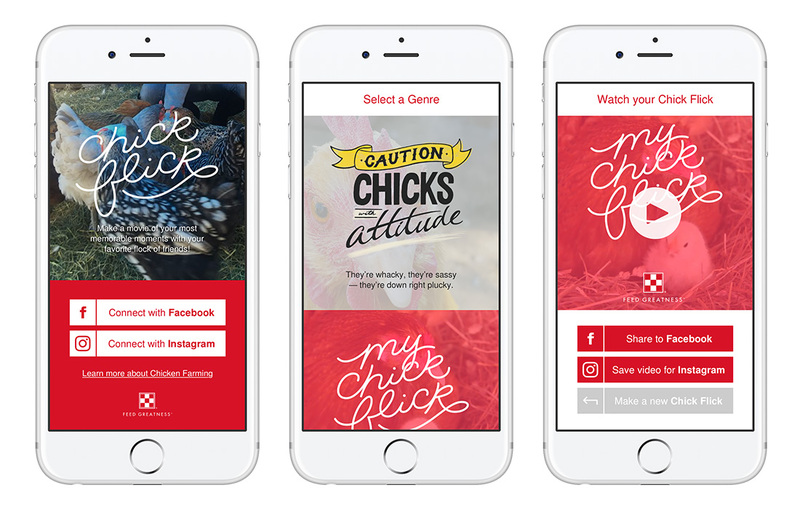 Ultimately, the "Chick Flick" concept won out and we embarked upon creating an experience that allows our audience to connect their Facebook or Instagram accounts, pick their favorite photos of their flock and stitch together a sharable video based on one of several selectable themes. We created three unique visual themes and crafted a complete web-app user interface to make the video stitching process a breeze. Our audience loved it and we had hundreds of thousands of shares across multiple social platforms.